Then the angel said to me, "Write: `Blessed are those who are invited to the wedding supper of the Lamb!'" And he added, "These are the true words of God." At this I fell at his feet to worship him. But he said to me, "Do not do it! I am a fellow servant with you and with your brothers who hold to the testimony of Jesus. Worship God! For the testimony of Jesus is the spirit of prophecy." I saw heaven standing open and there before me was a white horse, whose rider is called Faithful and True. With justice he judges and makes war. His eyes are like blazing fire, and on his head are many crowns. He has a name written on him that no one knows but he himself. He is dressed in a robe dipped in blood, and his name is the Word of God. The armies of heaven were following him, riding on white horses and dressed in fine linen, white and clean. Out of his mouth comes a sharp sword with which to strike down the nations. "He will rule them with an iron scepter." He treads the winepress of the fury of the wrath of God Almighty. On his robe and on his thigh he has this name written: KING OF KINGS AND LORD OF LORDS. And I saw an angel standing in the sun, who cried in a loud voice to all the birds flying in midair, "Come, gather together for the great supper of God, so that you may eat the flesh of kings, generals, and mighty men, of horses and their riders, and the flesh of all people, free and slave, small and great." Then I saw the beast and the kings of the earth and their armies gathered together to make war against the rider on the horse and his army. But the beast was captured, and with him the false prophet who had performed the miraculous signs on his behalf. With these signs he had deluded those who had received the mark of the beast and worshiped his image. The two of them were thrown alive into the fiery lake of burning sulfur. The rest of them were killed with the sword that came out of the mouth of the rider on the horse, and all the birds gorged themselves on their flesh. Preterists see the avenging of the blood of God’s servants as judgement brought upon Israel for their persecution of the Christians, their history of shedding the blood of the prophets and their refusal to accept Jesus Christ as the promised Messiah. The description of Christ setting on a white horse coming with the armies of heaven and making war is viewed as God’s intervention and manifestation of power in bringing about the destruction of Jerusalem, the temple and the Jewish religious system. This is seen as accomplished through the Roman armies and their allies. The beast, along with the kings of the earth and their armies gathered together to make war against the rider on the horse is seen as the Nero led Roman government’s three and one-half massive persecution against Christians when many were tortured and put to death. The false prophet is seen as the religious leadership of the Jewish religious system which aided and abetted the Roman persecution of the Christians. The appearance of the bride having made herself ready is seen as the church persevering during the persecution and now being rewarded by having their persecutors killed and receiving entrance into the fully established Kingdom of God. Being thrown into the fiery lake is seen as symbolic of the death of Nero and the Jewish priesthood. Birds seen as gorging themselves on the flesh of those killed is viewed as fulfillment of Christ saying “Wherever there is a carcass, there the vultures will gather” (Matthew 24:28). Futurists view the descriptions of this chapter as a future coming of Christ’s to defeat the end time beast power and its religious affiliate and establish His millennial kingdom. The armies that come with Christ are seen as the raptured saints now returning to join Christ in the battle and be part of the millennial government. The “marriage of the Lamb” is seen as union between Christ and the church. Dispensationalists see this marriage occurring immediately after the rapture of the church. Being called to the marriage supper is seen by some as an event separate from the actual marriage and by others as coincident with it. Some Futurists see the symbolism of a sword coming out of the month of Christ as the word of God and the only weapon involved in the destruction of His enemies. Others view the sword more literally as representing physical destruction upon those who have failed to repent and embrace the Christian message. In this case the sword is linked with Christ’s power, rulership and authority. And I saw an angel coming down out of heaven, having the key to the Abyss and holding in his hand a great chain. He seized the dragon, that ancient serpent, who is the devil, or Satan, and bound him for a thousand years. He threw him into the Abyss, and locked and sealed it over him, to keep him from deceiving the nations anymore until the thousand years were ended. After that, he must be set free for a short time. I saw thrones on which were seated those who had been given authority to judge. And I saw the souls of those who had been beheaded because of their testimony for Jesus and because of the word of God. They had not worshiped the beast or his image and had not received his mark on their foreheads or their hands. They came to life and reigned with Christ a thousand years. (The rest of the dead did not come to life until the thousand years were ended.) This is the first resurrection. Blessed and holy are those who have part in the first resurrection. The second death has no power over them, but they will be priests of God and of Christ and will reign with him for a thousand years. 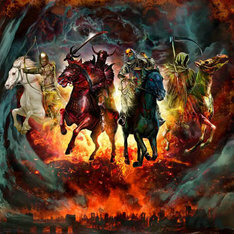 When the thousand years are over, Satan will be released from his prison and will go out to deceive the nations in the four corners of the earth--Gog and Magog--to gather them for battle. In number they are like the sand on the seashore. They marched across the breadth of the earth and surrounded the camp of God's people, the city he loves. But fire came down from heaven and devoured them. And the devil, who deceived them, was thrown into the lake of burning sulfur, where the beast and the false prophet had been thrown. They will be tormented day and night for ever and ever. Then I saw a great white throne and him who was seated on it. Earth and sky fled from his presence, and there was no place for them. Futurist views vary as to the meaning of Revelation 20 based on how the millennium is understood. The three major positions on the millennium are briefly defined in part four of this series. In keeping with our format for this series, we will contrast only the Dispensational Premillennialists view with that of the full Preterist view. The Dispensationalist Premillennialists see Christ returning in a literal manner in our future to destroy His enemies represented by the beast power and the false prophet. Christ will then establish a literal 1000 year reign with His government headquartered at a rebuilt temple located in a refurbished city of Jerusalem. This coming will involve the change of the living saints from having physical bodies to having spiritual bodies and the resurrection of dead saints who also will receive a spiritual body. These saints will rule with Christ during this thousand year period during which time Satan will be bound. After the thousand years are over, Satan will be loosed for a short time and be successful in deceiving the nations of the earth whose armies will surround Jerusalem and be subsequently destroyed by Christ. Satan will be thrown into the lake of fire where the beast and false prophet were thrown. This is followed by the resurrection and judgement of all who have died throughout history. A slight variation of this view is seen in the idea that the resurrection after the millennium will involve all those who have died not having had a legitimate opportunity to accept Christ. These will be given a 100 year period to accept and show commitment to Him. At the end of this 100 year period, there will be a final resurrection where the incorrigibly wicked will be sent to everlasting torment or permanently destroyed depending on one's view of the fate of the wicked. Throughout this series we have contrasted the Futurist view with the full Preterist view as these two views represent the greatest difference in how the Revelation is understood. A full Preterist believes the entire Revelation was fulfilled in the events surrounding the Judgement upon Israel in the first century. A Futurist, by contrast, sees most if not all fulfillment yet in our future. While all full Preterists believe the events of the Revelation were fulfilled in the first century, there are some differences in viewpoint as to the nature of the millennium and the resurrection. We will provide the general viewpoint of Preterists on this chapter. Preterists generally view the 1000 years as symbolic of the forty-years between the ascension of Jesus Christ and His return in Judgement upon Israel in A.D. 70. This is looked upon as the transition period between the demise of the Old Covenant and the establishment of the New Covenant. It was a time of resurrection from spiritual death unto spiritual life and is viewed as the first resurrection. Some Preterists believe the first resurrection is an actual “rapture” of Christians at the time of the return of Christ in A.D. 70. and the second resurrection takes place later. Through the church Christ is seen as reigning and the saints were reigning with Him as a royal priesthood. Satan was bound in so much that he could not prevent the Church from developing. The saints are seen as suffering great persecution but being made spiritually alive in Christ. A number of Jewish rabbis, writing in the first and second centuries, believed that the days of the Messiah would be a transitional period of forty years between this present world and the world to come. Preterists believe that the present world was the Old Covenant world and the world to come is the New Covenant being established and fully consummated in the events of the Roman/Jewish war. At the end of this symbolic thousand year period, Satan is let loose to ignite the Jewish revolt and the Roman response. Christ is viewed as coming in power and glory through the vehicle of the Rome armies to facilitate judgement upon Israel. This effectively terminates the Old Covenant system and the Jewish persecution of the Christians. Judgement is also poured upon the persecuting power of Rome as seen in the suicide of Nero and the tremendous upheaval in the Roman Empire at the time. This gives Christians reprieve from torture and death. Resurrection of the rest of the dead occurs during this time. These resurrected are all who have died throughout history and now face a determination as to their future. This resurrection is viewed not as physical bodies coming out of the ground but as a resurrection of passing from spiritual death unto spiritual life or being eternally separated from God. Satan, Death and Hades (hell) being thrown into the lake of fire is considered symbolic of Christ having destroyed spiritual death and the perpetrator of such death, namely Satan. Preterists see the spiritual Kingdom being fully established at this point and equated with what is considered a spiritual New Jerusalem coming down from heaven as described in Revelation 21. Those who accept Christ from this point onward pass from spiritual death unto spiritual life and upon physical death become part of the spiritual realm. Preterists don’t have a unified perspective as to the fate of the unsaved dead. As is true of Futurists, some Preterists believe in eternal annihilation of the wicked while others believe in some form of eternal conscience punishment. Then I saw a new heaven and a new earth, for the first heaven and the first earth had passed away, and there was no longer any sea. I saw the Holy City, the New Jerusalem, coming down out of heaven from God, prepared as a bride beautifully dressed for her husband. And I heard a loud voice from the throne saying, "Now the dwelling of God is with men, and he will live with them. They will be his people, and God himself will be with them and be their God. He will wipe every tear from their eyes. There will be no more death or mourning or crying or pain, for the old order of things has passed away." He who was seated on the throne said, "I am making everything new!" Then he said, "Write this down, for these words are trustworthy and true." He said to me: "It is done. I am the Alpha and the Omega, the Beginning and the End. To him who is thirsty I will give to drink without cost from the spring of the water of life. He who overcomes will inherit all this, and I will be his God and he will be my son. But the cowardly, the unbelieving, the vile, the murderers, the sexually immoral, those who practice magic arts, the idolaters and all liars--their place will be in the fiery lake of burning sulfur. This is the second death." One of the seven angels who had the seven bowls full of the seven last plagues came and said to me, "Come, I will show you the bride, the wife of the Lamb." And he carried me away in the Spirit to a mountain great and high, and showed me the Holy City, Jerusalem, coming down out of heaven from God. It shone with the glory of God, and its brilliance was like that of a very precious jewel, like a jasper, clear as crystal. It had a great, high wall with twelve gates, and with twelve angels at the gates. On the gates were written the names of the twelve tribes of Israel. There were three gates on the east, three on the north, three on the south and three on the west. The wall of the city had twelve foundations, and on them were the names of the twelve apostles of the Lamb. The angel who talked with me had a measuring rod of gold to measure the city, its gates and its walls. The city was laid out like a square, as long as it was wide. He measured the city with the rod and found it to be 12,000 stadia in length, and as wide and high as it is long. He measured its wall and it was 144 cubits thick, by man's measurement, which the angel was using. The wall was made of jasper, and the city of pure gold, as pure as glass. The foundations of the city walls were decorated with every kind of precious stone. The first foundation was jasper, the second sapphire, the third chalcedony, the fourth emerald, the fifth sardonyx, the sixth carnelian, the seventh chrysolite, the eighth beryl, the ninth topaz, the tenth chrysoprase, the eleventh jacinth, and the twelfth amethyst. The twelve gates were twelve pearls, each gate made of a single pearl. The great street of the city was of pure gold, like transparent glass. I did not see a temple in the city, because the Lord God Almighty and the Lamb are its temple. The city does not need the sun or the moon to shine on it, for the glory of God gives it light, and the Lamb is its lamp. The nations will walk by its light, and the kings of the earth will bring their splendor into it. On no day will its gates ever be shut, for there will be no night there. The glory and honor of the nations will be brought into it. Nothing impure will ever enter it, nor will anyone who does what is shameful or deceitful, but only those whose names are written in the Lamb's book of life. Preterists view chapter 21 as descriptive of the church washed in the blood of Jesus and appearing perfect and righteous before God. The old heaven and earth is believed to represent the Old Covenant system which is passed away and the new heaven and earth is believed to represent the New Covenant system which is now established. God is seen as dwelling within the church and facilitating eternal life and therefore freedom from spiritual death. The old order of things having passed away is seen as the Old Covenant of death having passed away and the making of all things new is seen as the New Covenant of life being established. Those who remain faithful to God are seen as inheriting eternal life and those who live contrary to what God requires are seen as experiencing the second death. This second death is viewed as eternal separation from the presence of God. The bride who is called the wife of the Lamb is seen as the church married to Christ through the provisions of the New Covenant and is represented in the glowing description of the New Jerusalem. The New Jerusalem is also seen as representing the Kingdom of God and is open to all who are willing to embrace its message. Futurists see in chapter 21 a description of a literal new heaven and earth. The 1000 years reign has come to an end with the defeat of Satan and the enemies of God. This has effectively abolished the old world order. God has now established his headquarters on planet earth as represented by the New Jerusalem. The New Jerusalem is seen as a literal city lowered to planet earth from heaven. The angel said to me, "These words are trustworthy and true. The Lord, the God of the spirits of the prophets, sent his angel to show his servants the things that must soon take place." "Behold, I am coming soon! Blessed is he who keeps the words of the prophecy in this book." I, John, am the one who heard and saw these things. And when I had heard and seen them, I fell down to worship at the feet of the angel who had been showing them to me. But he said to me, "Do not do it! I am a fellow servant with you and with your brothers the prophets and of all who keep the words of this book. Worship God!" Then he told me, "Do not seal up the words of the prophecy of this book, because the time is near. Let him who does wrong continue to do wrong; let him who is vile continue to be vile; let him who does right continue to do right; and let him who is holy continue to be holy." "Behold, I am coming soon! My reward is with me, and I will give to everyone according to what he has done. I am the Alpha and the Omega, the First and the Last, the Beginning and the End. "Blessed are those who wash their robes, that they may have the right to the tree of life and may go through the gates into the city. Outside are the dogs, those who practice magic arts, the sexually immoral, the murderers, the idolaters and everyone who loves and practices falsehood. "I, Jesus, have sent my angel to give you this testimony for the churches. I am the Root and the Offspring of David, and the bright Morning Star." The Spirit and the bride say, "Come!" And let him who hears say, "Come!" Whoever is thirsty, let him come; and whoever wishes, let him take the free gift of the water of life. I warn everyone who hears the words of the prophecy of this book: If anyone adds anything to them, God will add to him the plagues described in this book. And if anyone takes words away from this book of prophecy, God will take away from him his share in the tree of life and in the holy city, which are described in this book. He who testifies to these things says, "Yes, I am coming soon." Amen. Come, Lord Jesus. The grace of the Lord Jesus be with God's people. Amen. Futurist see chapter 22 as a continued description of the blessed life found in the new world order. The river of life and the tree of life are seen to represent eternal life now inherent in those who were faithful to the end. There no longer being a curse is felt to refer to the curse of death that originated with the sin of Adam and Eve but now eliminated through the sacrifice of Christ. Reference to the wicked outside the city is seen as the wicked being forever separated from the presence of God. References to Christ coming soon are viewed as Christ saying when He comes it will be quickly. Preterists view the river and tree of life as representative of access to eternal life through the sacrifice of Jesus Christ. Removal of the curse is viewed as removal of the death penalty for sin. Additional descriptions of the city are seen as symbolic of the new life of a Christian in the Kingdom of God. Reference to the angel sent to show things that must soon take place is seen as evidence for the imminency of fulfillment of what has been given in the Revelation. Christ saying He is coming soon is seen as giving further evidence for this imminency. Preterists remind everyone that the Revelation is addressed to seven first century churches who are told at the start of this message and now again at the end of this message that what they are being told is about to come to pass. Preterists point out that John is told not to seal up the words of this prophecy because the time is near. Christ again says “I am coming soon” and repeats it one last time at the very end of this message. Preterists believe that all these references to imminency are irrefutable evidence for a first century fulfillment of the Revelation. Preterists will show in great detail there simply is no grammatical, linguistic, or contextual reason to view the word soon as referring to long periods of time or Christ coming quickly when He comes. Preterists see reference to the wicked existing outside the city as evidence that evil has not been removed, the world still exists and physical life goes on. The church, however, as represented by the city, is a spiritual organism which when entered provides for the forgiveness of sin and the gift of eternal life. We began our examination of the Revelation by showing the word Revelation is a translation of the Greek word Apocalypse which means to unveil, uncover or reveal. Hopefully this series has contributed to a greater revealing of what Jesus Christ said to the seven churches through John. We have pursued our study of the Revelation within the framework of the two most currently popular interpretative approaches. I trust the reader has carefully considered the reasoning presented by both viewpoints and will be able to determine which viewpoint offers the most convincing evidence.